What a perfect gift idea! the watch case keeps your watch collection clean and organized with several slot watch holder. 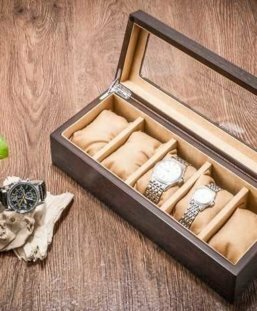 The premium leather mens watch box with white contrast hand stitching is sure to be an elegant touch in any room. Collection watch case for men is specially for larger modern watches in mind. The slots are wider and interior clearance is taller. Each slot can fit up to 5cm (or larger depending on the arrangement.). Just because this case is for larger watches in mind. It doesn’t mean we forgot about ladies’ watches or people with wrists smaller than polar bears. Our signature soft pillows will fit small watches without stretching the band. 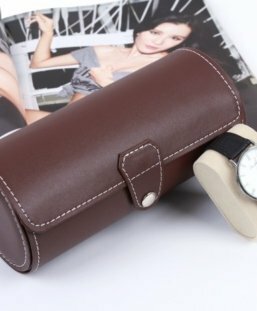 The leather watch roll prepare in a manner to look professional. As well as handmade at the same time which is also very strong with a fashionable. Also it has strong strap and has slots to carry watches. 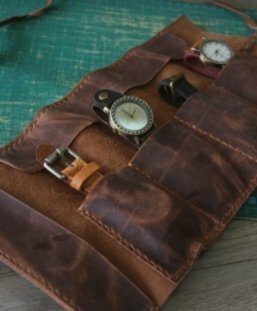 This Leather case is perfect to keep in arraning your watches when you travel. It is great for watch lovers. For greater security it is made with two lids. In this roll there are no parts that can scratch your watches. The case has several closures such as a leather strap or a stainless steel buckle. You can also treat it as tool case, make up pouch or pencil case. Made from distressed top grain leather, buttery soft, it will develop more beauty as time goes. FlixGifts craftsmen handmade it. From cutting leather, punch holes, and hand stitch waxed thread, we even have several thread colors for choice. 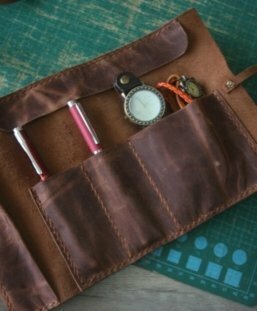 You can also use the leather watch case as a pen sleeve, or a tool roll. We can custom make for you, if you need it taller or wider, please contact [email protected] to reach an agreement! FlixGifts use suede brush to fluff the interior, water based leather lotions and cleansers shine and protect. 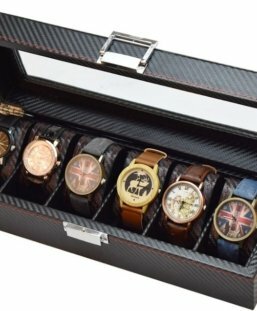 Usually the leather watch case can hold up to 4 watches, if you have a specific requirement, such as you need 5 pockets, please contact us, flixgifts are more than happy to create a for you. Pockets are a generous 3.2″ square (8.1 cm) large enough nearly all watches. Coordinating leather tie is looped through a grommet for easy replacement. Due to the premium quality of the leather, some watch rolls has no lining up with cotton or any other material. Our craftsmen hand stitch it using thick, waxed thread, resulting in a true amazing piece that will last generations of use. FlixGifts Studio can personalize it for you due to size limited, we do not recommend emboss many contents on the watch roll. We suggest to emboss a simple name, or initials, or a short words, these will looks better that long sentences. Colors may vary upon your screen resolution and other computer settings outside of our control. The photo may differ from the actual product due to limitations of viewing photos at different resolutions, hue, brightness, contrast, and other screen variations. Leather gift ideas: A useful and unique leather watch case featuring your own name is a outstanding symbol of yourself when you travel. Each one is handcrafted in FlixGifts flexible studio using traditional craft techniques. 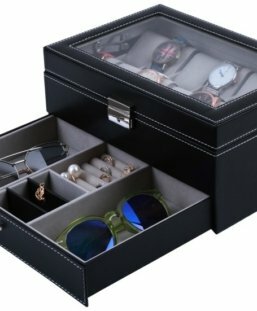 This watch organizer case is made of high quality leather. The watch roll storage for watches is the best choice for people who often travel. 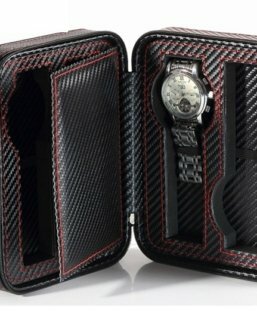 This watch organizer case is made of high quality carbon fiber. 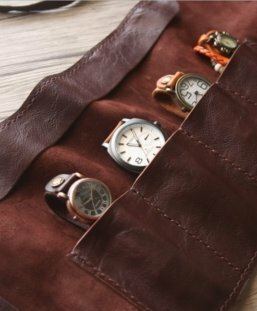 This watch roll storage for watches is the best choice for people who often travel. This watch organizer case is made of high quality eco-leather. The watch roll storage for watches is the best choice for people who often travel. Personalized men watch holder is made of high quality eco leather and the best choice for watch storage. 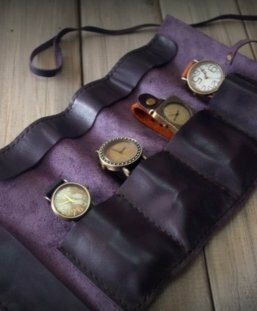 This watch organizer case is made of high quality leather. FlixGifts watch roll storage for watches is the best choice for people who often travel. This watch organizer case is made of high quality PU leather. The storage for watches is the best choice for people who often travel. This wood watch box case is made of high quality wood. The storage for watches is the best choice for people who often travel.